Observation - Abandoned Badger Sett - UK and Ireland. Description: This mound is the remains of an abandoned badger sett on grassland at the edge of Spittlemore Coppice Hatfield Forest. There are signs of recent excavation, proably by rabbits. 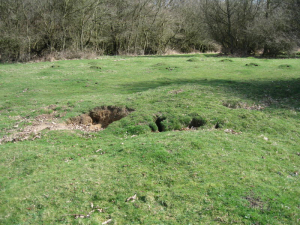 This mound is the remains of an abandoned badger sett on grassland at the edge of Spittlemore Coppice Hatfield Forest. There are signs of recent excavation, proably by rabbits.